A DSO, as it pertains to Special Service Mustangs, stands for Domestic or Dealer Special Order. On regular-production Mustangs, the DSO is only a two digit number that is assigned to the regional office (District Sales Office) that originally ordered the car. All Mustangs have this two digit code on the door data tag (or Vehicle Certification label) on the inside face of the driver's door, irregardless. All special-ordered Mustangs, whether or not a Special Service car, have a six digit number, instead of just a two digit one. The first two numbers still delineate the Sales Office, but the last four are the actual Dealer Special Order number. For instance, if a dealer special-ordered five Mustangs for a promotion in a non-stock paint color, such as a Thunderbird Blue, all five Mustangs would have the same six digit DSO code, ie. 24-0327, with 24 being the ordering sales office (Jacksonville, FL), and 0327 being the special order number (sequential). All Special Service Mustangs were dealer-only, special order units, and thus also have the six digit DSO codes. If a particular state, such as Florida, ordered 50 SSP Mustangs in 1985, that order would have the same Special Order code and the cars would have all been comparably equipped option-wise. Some states apparently split their orders, or took delivery in stages, and were given more than one special order number. Also, it appears that changing the option content drastically amongst the order would result in more than one number being generated, as is the case with the unmarked cars ordered by the Florida Highway Patrol (mostly automatic cars, in various colors. 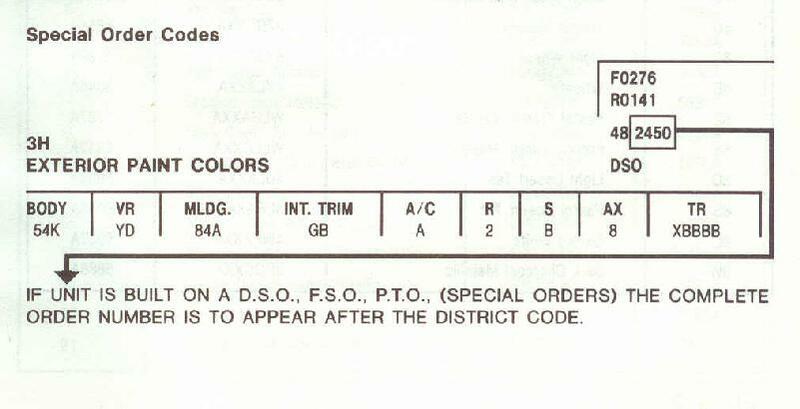 The DSOs for the 1993 model year are different between the marked and unmarked, as an example). It's important to remember that the mere presence of a 6-digit DSO code doesn't identify a particular car as a Special Service Mustang. The code, when used in conjunction with other identified equipment, will certainly help in the identification process, as will the absence of the 6-digit format. 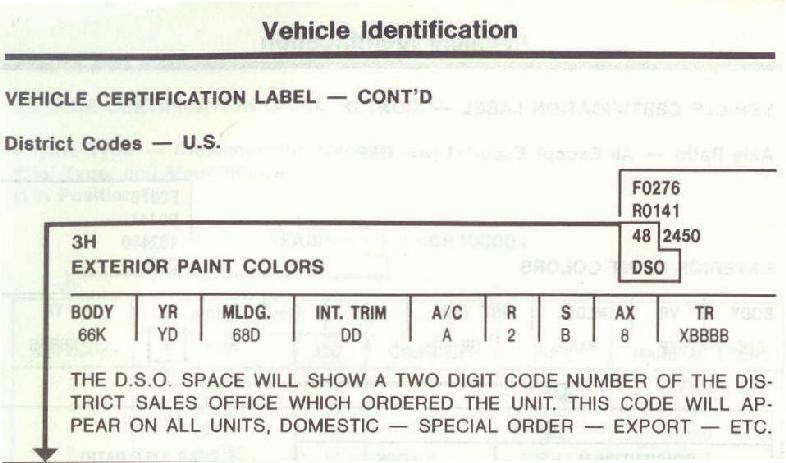 The images below come from the 1983-1993 Ford Specifications books, and further illustrate the differences between the Sales Office and Special Order codes. Image courtesy of the 1984 Ford Car Specifications book. Notice that the last 4 are the special order number, and not a "group" or set of options codes. Image courtesy of the 1984 Ford Car Specifications book. The code table below pertains to the 2-digit District offices, which are the first 2 digits of the 6-digit DSO number.